SagePay is one of the many payment processors we offer through the Payment Gateway feature on the Cloudbeds' platform. SagePay and Sage are both branches of the same company. Sagepay supports the United Kingdom and Ireland, while Sage supports North America. SagePay provides authorization, capture, sale, credit and void functions for your account. You can perform a partial refund, but you will not be able to refund the remaining amount afterwards. Make sure the currency used in myfrontdesk matches the currency used in SagePay (British Pounds for UK and Euro for Ireland). If you plan to accept PayPal payments, you can configure your myfrontdesk account to do that directly. If you don't have a SagePay account yet, click here to apply. AVS stand for Address Verification Service. By disabling it, you will be able to charge for reservations where Guest's address was not provided. 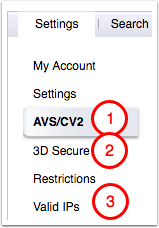 3D Secure is a feature not currently supported by Cloudbeds. By disabling it, you will be able to charge for reservations without this extra layer of security. Error 4020 : information received from an invalid IP address. Make sure you have added the IP addresses to your account as instructed previously in this article. For Test Mode you need to use Test Credit Cards provided here. Error 4000 : The VendorName is invalid or the account is not active. Logging into MySagePay: the value entered into the top box is your Sage Pay vendor name. Check your SagePay emails: - when your account is added to their system, they will send you a series of emails that will include your vendor name. Contact their support team: as long as you have either your merchant number, or Sage Pay account ref (V00......) their team will be able to provide your vendor name. Error 4001: The VendorTxCode has been used before. All VendorTxCodes should be unique. This error occurs when you try to refund a charge more than once. If you have already partially refunded a charge, you will not be able to refund the remaining from within myfrontdesk. You can still refund the remaining from within your SagePay account. Error 3046: The VPSTxId field is missing. This error occurs when you try to refund a charge that was captured from an authorization. We are currently investigating this issue. Error 4006 : The TxType requested is not supported on this account. The transaction type you are trying to perform may not be available for your SagePay account. Please contact SagePay's support team with your vendor name and the transaction type you are attempting to process and they will be able to add this to your account. Error 5020 : The Card Address is required., 3156 : The Card City field is required., 5022 : The Post Code value is required., 3158 : The Card Country field is required. The credit card details do not include some of the required billing details. You should disable AVS checking on your SagePay account to process these cards.